For more than 25 years, Italian designer Andrea has created jewelry possessing a unique dynamic of purity, linearity and flowing grace. His exclusive style is sought-after all over the world. Each creation seems to flow uninterrupted to elegantly embrace the precious light of faceted jewels. Andrea’s collections are conceived and realized in his studio in Parabiago, Milano. We asked Andrea to work with helenite, known as “America’s emerald,” to produce a special, transatlantic collection. 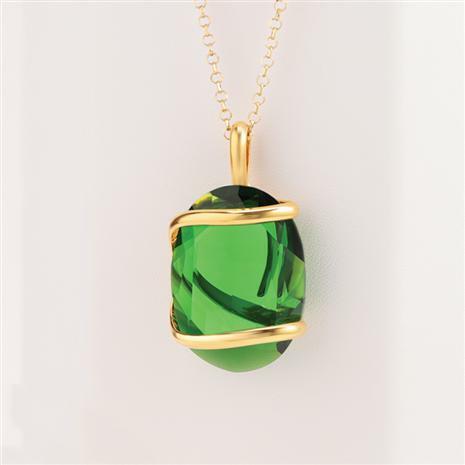 Helenite was first formed after the powerful eruption of Mount St. Helens in 1982, when the resulting mix of ancient minerals were found to produce an incredible, perfectly green gemstone known as helenite. Andrea over delivered in our opinion. The Helenite Fluente Pendant features generous stones of verdant helenite embraced by Andrea’s sleek, flowing, gold-finished design. There’s a beautiful connection between the volcanic power of helenite’s origins and Andrea’s careful, precise handiwork that now holds it in place. You could pay thousands for gold-finished Italian designs if you don’t mind paying the big designer brand upcharge. Or, you could take advantage of our superior domestic and foreign relations and tap into our treasury for less.